Tingling extremities, known medically as paresthesia, are the uncomfortable “pins and needles” sensation that typically occurs in the arms, hands, fingers, legs, and feet. While disturbing, this symptom can be managed successfully. 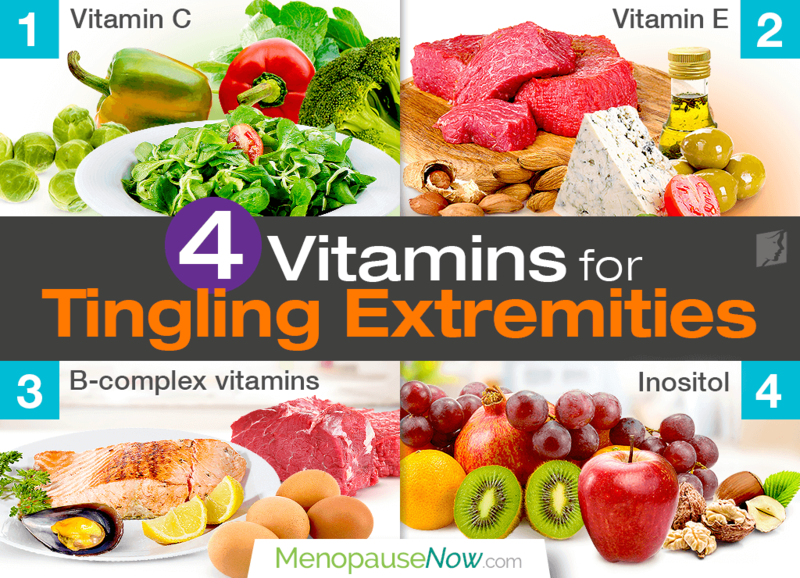 Continue reading to find out the top four vitamins for tingling extremities as well as other solutions to consider so that you can go back to feeling comfortable in your own skin. Also known as ascorbic acid, vitamin C is an important antioxidant that contributes to numerous cellular functions within the central nervous system (CNS). As a matter of fact, neurons in the CNS contain some of the highest concentrations of ascorbic acid of mammalian tissues. Foods rich in vitamin C include green and red peppers, leafy greens like spinach and turnip greens, tomatoes, broccoli, and Brussels sprouts. Vitamin E has antioxidant properties, which can help prevent tingling extremities by protecting cells against free radicals to ultimately support nerve health. Its deficiency can cause nerve pain (neuropathy). Foods rich in vitamin E include olive oil, nuts (almonds and peanuts), meats, dairy, leafy greens like spinach, and fortified cereals. This multivitamin supplement includes vitamins B1 (thiamine), B3 (niacin), B6 (pyridoxine), and B12, all of which are essential for proper nervous system health. B12 is especially important for the body to make red blood cells, synthesize DNA, and carry out other functions. Its deficiency can also lead to pernicious anemia, which can also cause nerve damage. Find these vitamins in seafood, meat, and eggs. Colloquially referred to as vitamin B8, inositol is a vitamin-like substance that has been shown to improve nerve function in those suffering from diabetic peripheral neuropathy, making it a perfect addition as a vitamin supplement for tingling extremities. The best sources of inositol are nuts, fresh fruits, beans, and grains. Sleep. Getting plenty of sleep is vital for your overall well-being. The average adult needs between seven and eight hours of sleep every night. Eat properly. Maintain a balanced diet filled with fresh fruits and vegetables and staying hydrated by drinking at least seven to eight glasses of water daily. Exercise. At least 30 minutes of aerobic activity, five times a week is recommended to reduce stress, improve circulation, and boost energy. Yoga, swimming, and walking are all excellent low-impact exercises. Also, you should seek medical attention immediately if you experience tingling extremities and numbness in combination with slurred speech, blurred vision, or loss of bladder control. This could indicate a more serious health condition, like a stroke. While lifestyle changes and supplements for tingling extremities may keep the symptom at bay short-term, long-lasting relief will only come once the underlying cause is resolved, hormonal imbalance. Read more about treatments for tingling extremities during menopause so that you can get on your way to having optimal nerve health and a symptom-free life. May, J.M. (2012). Vitamin C transport and its role in the central nervous system. Sub-cellular Biochemistry, 56, 85-103. doi: 10.1007/978-94-007-2199-9_6. Olefsky, J. M., Taylor, S. I. (Eds.). (2004). Diabetes Mellitus: A Fundamental and Clinical Text. United Kingdom: Lippincott Williams & Wilkins. Available from Google Books. The effects of aging change your body both inside and outwardly. As your skin loses its elasticity, you may notice a duller color, dryness, and tingling. Tingling sensations can be disruptive, puzzling, and - surprise! - yet another symptom of menopause. Here's five ways to tackle them.